If you're experiencing difficulties with your memory, always check it out with your doctor first just to be on the safe side. We have all been there, where we have forgotten someone's name, which can be quite embarrassing. Everybody has memory blanks where we forget our passwords, phone numbers and pin numbers which again can make you feel very uncomfortable. However, all is not lost because you may be able to slow down your brain degeneration and even improve it, by implementing some new positive lifestyle and diet changes..
We all suffer the occasional memory lapse you know the times like you can be going to fetch something and once you get there you forget what you were coming for. Many people put their memory loss down to old age, and they will often put up with it or accept it as part of getting old, but this is not always the case. There are things that you can do to possibly slow down memory loss or even improve it regardless of your age. Many people assume that poor memory is all down to the mind. However, there is a powerful connection between the mind and body. This means that our mind has a big impact on our body, but it also works the other way, and our body has a powerful impact on our brain. When our brain and body has everything that it requires and it is functioning at its peak and optimum efficiency, then we should have good brain health. You can improve your memory and mental sharpness, as we go about our daily business, we look at many objects, images and things without really storing the information and colors, everything just fits in with the background. But you can use objects and everyday things to help improve your memory and focus. As you go about your daily routines, every now and again start to take a closer look at things. Observe a small group of objects or items. Imagine your like a camera and you're taking a quick snapshot. Take a mental picture of each object as if you're taking a photo, just take a quick look at each item no more than a second or two. Try and mentally store as much detail in that quick glance, notice the colors and distinct features of each item, then move onto the next one, spend about twenty seconds observing your small collection of items. Then, while you're no longer looking, try and recall each individual item. Stress, emotional issues and tension can all disrupt your ability to focus and concentrate as well as causing forgetfulness and affecting your short term memory. Stress makes us stupid and forgetful. Scientists, studying how stress, affects our brains, are finding out how stress can affect our memory, mental speed and decision making. In studies conducted on mice. The mice were put in tanks of water, where there were raised platforms for them to swim to. The mice had no problem swimming to the platforms. The scientist found, that when mice were played stressful sounds, they had a harder time remembering their way to the safe platforms. Studies found, that stress slowed the brain's ability to connect brain cells that form memories and affected the brain's ability to process information. This gives us an insight into how stress can affect our memory, make us forgetful and prevent us from thinking clearly. If you want to prevent your brain from declining, then you will need to implement, some healthy lifestyle strategies and techniques to help to reduce your stress. Because there is nothing more damaging to the brain, than stress. Lack of sleep can disrupt our short term memory and make our memory a bit foggy. Sleep deprivation can also affect our ability to focus and concentrate. When we are asleep our brain processes all our memories of the day and stores and files them in our long term memory bank. This is the time when your brain does all its housework, and this is why it is important, to get a good night's quality and restorative sleep. Scientists describe this stage as slow wave sleep, the non, dream deep like sleep, that takes place in the first few hours of our natural sleep cycle, where they say our brains transfer our memories from one location in the brain to another. But it is not just the amount of sleep that you get, everybody is different and some people seem to need to sleep more than others. What is probably more important is the quality of sleep that you get. The scientists are saying, that if you have, bad or restless sleep our memory functions worse. The good news is. If you can start to get a good night's restful sleep. Then there is a high chance that you can improve your memory. Again, things like worry, emotional issues or stress can disrupt your sleep patterns and cause you to have a bad quality restless sleep. A healthy, balanced, varied diet with high quality nutrition can play an important factor in maintaining good brain functioning, and it may even help to improve your memory. Studies have shown that you can improve your brain health by eating the right foods and cutting back on the bad foods.. The best way to prevent the degeneration of your brain, is to try and figure out if you can, what is behind the root cause of your forgetfulness. Then it can pay to get rid of all of the bad stuff that might be partly responsible and begin to replace it with the good stuff and a more healthier lifestyle. There are many things that might bring on forgetfulness and brain fog. Some of the possible causes are, stress, toxins and lack of sleep as already mentioned. Other factors may include environmental and poor diet, inflammation, inactivity, food sensitivity and a nutrient deficiency and omega 3 fat deficiencies. As a general rule, it is recommended that we consume more inflammation reducing omega 3 fatty oils than the omega 6 fatty oils, which may increase inflammation. According to research, vitamin B12 is important for your brain to function optimally. One study has shown that vitamin B12, as well as folic acid and vitamin B6, can slow brain shrinkage in mild cognitive impairment. Magnesium is also another essential nutrient that can help to calm you and reduce stress, tension and anxiety. Some people may be sensitive to certain foods which is believed to cause inflammation in the body and brain, which may affect our brain functioning. It may be advisable to cut back on having too many processed foods, high in omega 6 fat foods, sugary foods and junk foods and replace them with plenty of healthy food, like green leafy vegetables, fruits, protein, good carbohydrates, fiber and foods rich in omega 3 fatty acids. Green leafy vegetables, especially, spinach, kale, brussel sprouts, leeks, lentils, oranges, watercress and cauliflower are all believed to be good for the brain. Berries, grapes and cabbages, apples and onions are also believed to be good brain foods. 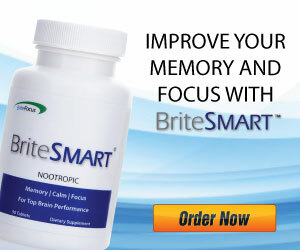 Clinically proven concentration, memory, focus! Try now! Coconut oil is now getting a lot of attention, because it is thought to be beneficial for people with memory degeneration and loss issues. Check with your Doctor or dietician if you're not sure. Stress is not just an emotional symptom, it is also a physical state. Exercise is one way of treating the physical symptoms of stress and anxiety. We all know that exercise is good for us as it helps to strengthen and tone our muscles, but there are many more benefits of exercise, and there is plenty of evidence to suggest that exercise may also be good for your brain, especially your memory. Exercise, may help to improve your learning ability, by helping you to learn faster as well as improve your mood. According to research performed in the Netherlands. Physical exercise that is performed around four hours after learning, can help remember that learnt information better. Exercise is believed to release proteins that can give the part of the brain that is associated with memory a boost. But the study, does suggest that it is important to get the timing right. The study, tested 72 people, to see how good their memory recall was. The whole group spent 40 minutes learning the information, The Researchers, then split the group up, into three sets of people, to perform 35 minutes high intensity exercising on an exercise bike. Each group, was then tested, two days later to see how much information they could recall. The second group that exercised, four hours after the learning performed the best. The conclusion to the test, suggested, that exercising around four hours after learning or studying can seem to help, long term memory. They're not quite sure, why the time delay, helped to store and recall the information. But one theory is. Exercise activates the release of your feel good endorphins as well as helping to increase your blood flow, which can help your brain, consolidate your memories. This may indicate, that regular exercise, or any form of relaxing and generally feeling good, may help to improve your long term memory. We are certainly smarter, more focused and we have a better recall, when we feel calm and balanced. Engaging in art or using your creativity is believed to benefit and improve your memory and your cognitive functioning of your brain. The more you use your brain for creativity and problem solving instead of engaging and focusing on our problems, worries and personal issues, the better your brain will function and operate efficiently. Stress and negative emotions block off your creativity and your natural ability to problem solve and figure things out. In fact stress and negative and destructive emotions and thought patterns, create more negative energy and more problems. Positive, creative and constructive thinking, will help to delay premature aging in the brain. Painting, writing, photography, arts and crafts are all great ways to use your creative mind. Our memory helps us to understand ourselves, our world we use it with the aid of stories to put ourselves and our lives into context. Our visual memory tends to be more powerful than than our information memory. Our brains use images, sounds and associations to help us remember things. The mind learns to associate words with images, sounds etc and stores them in files. We are not so adept and storing and remembering written word even though many things these days are written down in word format. A quick way to improve your memory is to make a bright mental image of the things you want to remember and associate them with the words, the mind has a tendency to file images better than words. Often we only remember past events with experiences and things that have an emotional attachment. Our brain learns to associate and anchor things that have an emotional attachment, both positive and negative. We all have the potential to improve our memory, and there are things that you can do to improve your memory retention and recall. One way of improving your memory is through imagery. Basically, when you want to learn something new, you attach an image to the bit of information or thing that you want to remember. Let's say, you want to remember the word car. All you have to do is create the image of a car, to make it even easier, make the car a bright color. Now lets say, you have a list of six words, items or things that you want to remember or do, but you have not got a piece of pen or paper to write them down as a list. Now you want to be able to link all the things and items together so you can remember them all. To this. Imagine you are walking through your house. Say, you start off at the back door. As you imagine you're walking into the first room. Pick say, three or more location points. Let's say, you start off in the kitchen. Your sixth location point could be. You can add as many rooms or location points as you like. Obviously, everybodies houses will be different. Once you have got your location points throughout your house. Imagine you're walking through your house, starting in the kitchen. Once you have imagined these items or things to do, on their location points. Walk through each room in your mind, several times to further anchor the thing or item to its location point. Then later on, when you need to jog your memory. Go through each room, viewing each location point, to remind you of what you need to do or remember. Our memory is a bit like a muscle, the more you use it, the better you will become at remembering things. Often, we can go into decline as we get older, Sometimes a boring, mundane job or being socially isolated can lead to feelings of depression and even a degeneration in our brain health and emotional well-being. Social and intellectual engagement and positive interaction and stimulation can boost our cognitive brain health, as well as activating positive feelings of optimism and joy. Negative emotions, can lead to feelings of stagnation. If you feel alone and isolated, It may help to join a social group or evening class, with other like minded individuals or things that you're interested in. Maintaining social connections or by stimulating the brain, through learning new things or reading can boost our mood and improve our brain health and power. If you cannot get out, as much as you would like. You could, join up with some of the social media sites, and start to engage with others. Although it does not have any scientific evidence to support it. Some experts believe that turmeric can help to improve our brain and give our memory a boost. Turmeric, which is high in antioxidants, has already been well documented for Its anti-imflammoratary properties, and its detox abilities, and countless studies have revealed that turmeric is classed as the best healing herb. It is believed that turmeric is more beneficial when it is cooked in food. Other factors that may affect your brain health are. Again stress can affect your hormone levels and throw them out of balance, and stress and depression may cause the brain to shrink. There are ways though to make your memory better and learn to improve your memory. A variation on training your memory is to give it a rest or at least a hand. Write notes to yourself, set alarms on your phone or anything that will save you the pressure of trying to remember everything. The more you try and recall the more likely you are to forget stuff. Don't try to learn things by cramming your brain in one big hit. If you are reviewing for an exam or trying to learn a new skill, then take some time. Read information, take a break and then test yourself to see what you have learned. When satisfied carry on, don't read everything and then try and remember the first thing you read. All things you do in your life should be done when it's the best time, not always the best time for everyone else. If learning something new, pick a time to do it that suits you. Don't feel pressured to do anything because you are told it's right, do what works for you. The experts will give you tips on how to recall information and large pieces of information. Some will work for you and others won't, but you should try them if you believe it will work. Use tricks like making a story of the information or using pictures to help. Nothing is guaranteed to help everyone, but you will find a trick or two to help you improve your memory and your life. Can You Really Improve Memory with Subliminal Audio? More and more people are turning to alternative methods of learning such as using subliminal audio. This once seemed strange, but is now seen as pretty much mainstream. Subliminal audio will help you to learn and improve your memory naturally by sending positive suggestions directly into your mind - the source of your memory problems. It works in several ways. To clear out your mind and help you to remember information much more efficiently. - To improve your rate of focus and concentration so you can study and take in information for longer. - To help you to retain information for a longer time and recall it as if it was just new whenever you need to. Photographic-memory-development Subliminal audio is a simple tool really, it will help you to improve your memory by naturally and gradually re-shaping the way your mind works. It isn't instant, or miraculous as you might of seen on the TV, but it will help you, naturally, slowly, but surely. If you struggle with memory, then get a boost with the power of subliminal messaging - use this album to transform your memory function for the better. If you want to improve your memory without all of the time consuming effort of doing hours of puzzles why not try subliminal messages to help you to develop a Photographic Memory Development. The information on this page is for information use purposes and it is not meant to be a substitute for professional medical advice. You should not use this information for the diagnosing or treatment for health conditions. If you suspect that you have a health condition, always consult with your doctor.